When I was a little kid, my mom had this cake she made every year for Easter. It was made to look like the Easter Bunny’s face and covered in coconut, to mimic the Easter Bunny’s fluffy white coat. Little pieces of candy decorated this coconut covered bunny face to illustrate bunny eyes, nose and mouth. The coconut covered frosting was always my favorite part though. I guess that’s why when I started brainstorming for springtime Easter recipes, coconut was the ingredient that repeatedly came to mind. Part of me felt like I had to come up with something cutesy and shaped like bunnies or Easter eggs, but alas, I just wasn’t being hit with any cutesy Easter critter inspiration. So, I tried for a more practical approach. What would I bring to Easter brunch? I’ve had this donut pan sitting at the back of my pantry for quite some time now. This happens a lot. I learn about something I haven’t cooked yet, in this case baked donuts, get all excited and buy the necessary ingredients or equipment, and then forget about this new awesome food that I wanted to make until one day it falls from the pantry shelf and hits me in the head. In this instance the timing couldn’t have been better. 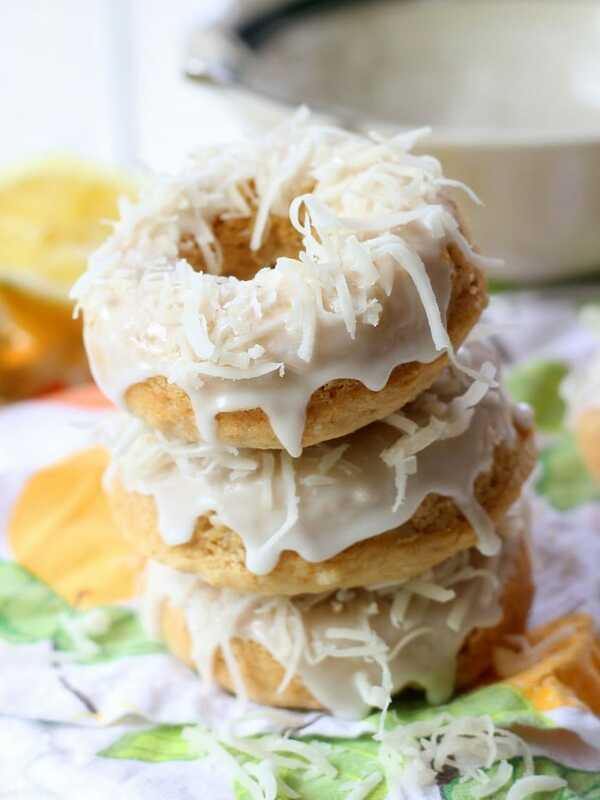 Everything soon came together in the form of lemon coconut donuts. Preheat oven to 350 and spray donut pans or baking sheet with nonstick cooking spray. Whisk together flax seeds and water. Set aside and allow to sit for at least 10 minutes. Meanwhile, stir together flour, baking powder, salt and lemon zest in small bowl. In a separate bowl, cream together margarine and sugar. Add flax mixture then milk, maybe just a bit at a time to avoid splashing, and lemon extract. Add in dry ingredients and blend until a uniform dough is formed. Fold in 1/2 cup coconut. 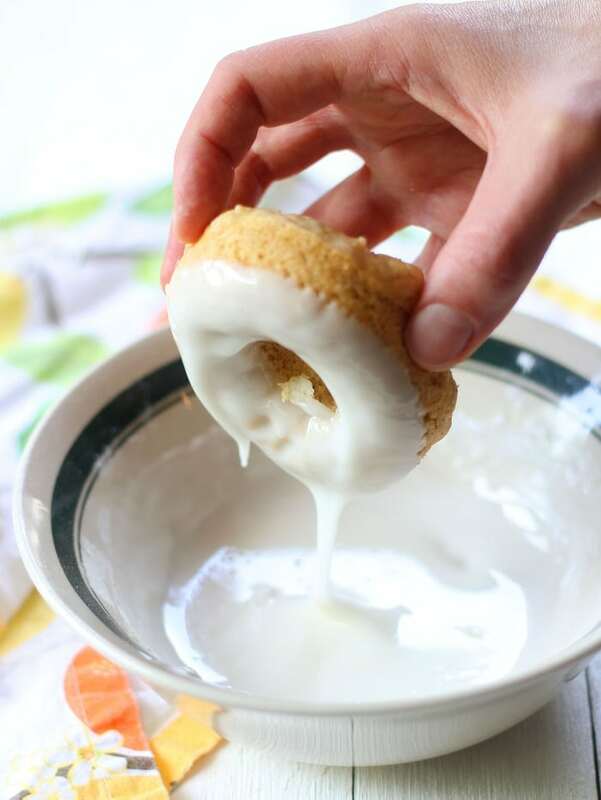 If you're making the "full" donut form of this recipe, distribute dough among donut forms. I found the best way to do this was by spreading it around with my hands. Otherwise, just roll dough into 24 balls and place on baking sheet. Remove from oven, allow to cool and remove from pan before glazing. While baking, whisk glaze ingredients together, using as much powdered sugar as needed to get the right consistency. 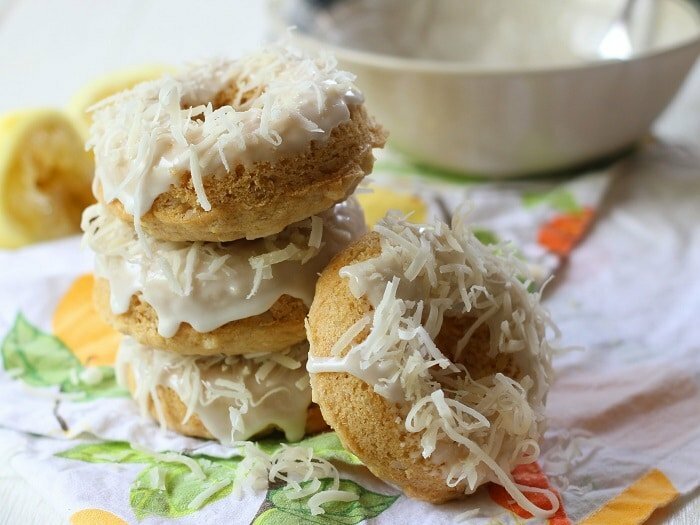 Drizzle glaze over donuts and top with remaining 1/2 cup of coconut. 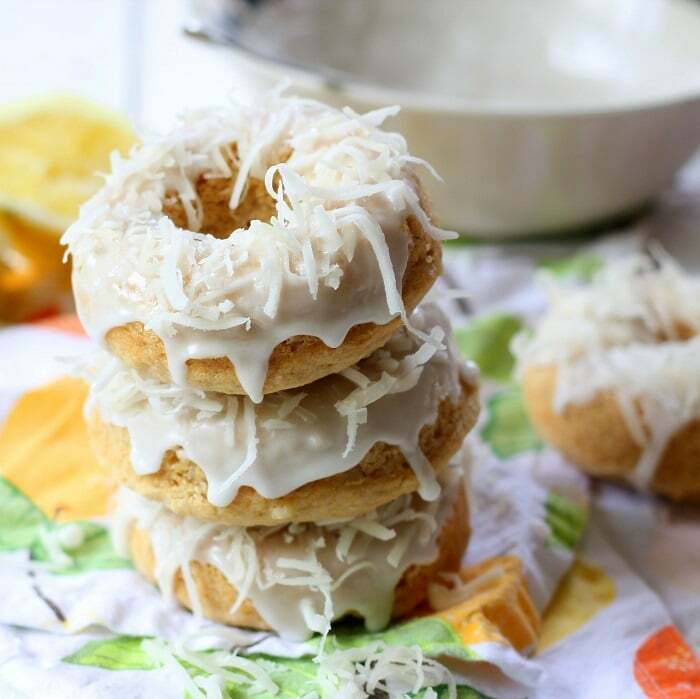 Where is the recipe for the lemon donuts? I have tried with Safari and Chrome and I’ve updated my flash player. No recipe. Cruel. Sorry! I found a technical glitch that was causing the recipe not to display. I think it should be fixed now. I haven’t tried mini donuts, but I think they’ll work! Hope you enjoy!! Using what I had on hand, I used all purpose flour, sweetened almond milk, vanilla instead lemon flavor, and chia seeds instead of flax. I reduced sugar to 1/4 cup and baking powder to 1 tsp because of high altitude where I live.. The result was 18 lovely little cakes with a fine texture. I will freeze them till needed, and then glaze them and top them with toasted coconut. Our vegan friend will be delighted! Awesome! I hope you and your vegan friend enjoy them!! I made these. They turned out so delicious. I had to use a lot of sugar for the icing (2.5 cups). Thanks Natalie! I’m glad you enjoyed them! These were great! I didn’t have lemons, so I used limes instead (including a bit of lime juice in the batter instead of extract). I also substituted three Tbsp aquafaba for the flax egg. My cooking time was 20 minutes. The texture was divine and the flavor was so delicate; my non-vegan husband ate four in one sitting! I’m so glad they were a hit! Thanks Jennifer!! How to make gluten free? I would try subbing a one-to-one gluten-free flour blend. Bob’s Red Mill ususally works for me, but I haven’t tested it with this recipe, so no guarantees! Can these be frozen for later?? Made these donuts this morning and they were a hit with the entire family! They are light, moist and full of lemon flavor! 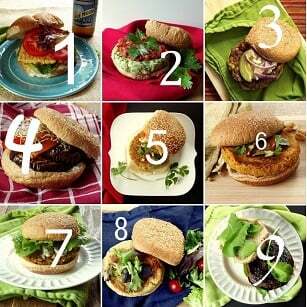 Will be making these again! Thanks, Alissa! I’m so happy to hear that!! Thanks Kathleen! The texture was outstanding. Very soft. I did have some issues getting the glaze to a consistency that wasn’t absorbed by the donut. Still good thoufh. I’m so glad you liked them! Thanks Sheila!